► QUICK RELIEF, POWERFUL, & LONG-LASTING! - Apply MaxRelief anywhere you experience Pain, Discomfort, Tingling, or Numbness including your Back, Neck, Knee, Hand, Wrist or Foot. Excellent for Sciatic pain. MaxRelief works on its own or with complementary therapies such as Heating Pads, Ice Packs, Arthritis Gloves, Back Pain Massagers, Tennis Elbow Straps, Carpal Tunnel Braces, Fibromyalgia Supplements, Neuropathy Socks, Sciatica Cushions, Tendonitis Supports, Bursitis Braces, etc. 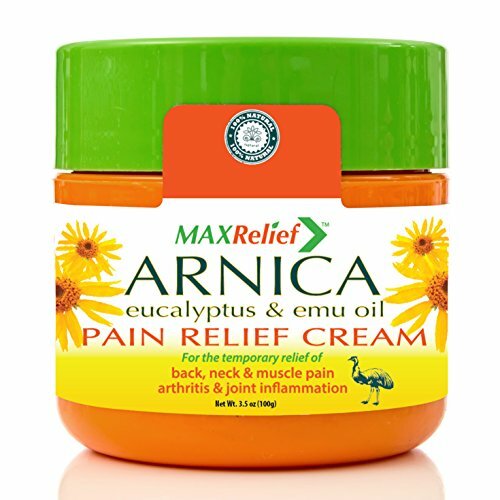 ► The only pain relief cream to include the extra benefits of Arnica, Eucalyptus, & Emu Oil► BREAKTHROUGH FORMULATION - We are the ONLY pain relief cream to include the tremendous pain relief benefits of Arnica, Eucalyptus, & Emu Oil in one incredible product. Support for Wrist and Lower Back pain. 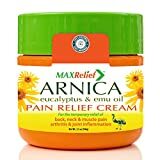 Arnica is trusted by professional athletes to soothe sore muscles, by prominent cosmetic surgeons to relieve post-procedure pain, and by savvy moms to treat playground bumps and bruises. ► Reduces arthritis pain, tingling and joint inflammation while increasing capillary circulation. Just rub it in. New and Improved Extra Strength Formula! Back To Normal Arnica Cream, 2 Ounces. FDA Registered. Topical Analgesic for Joint and Muscle Relief.